Wind back the clock, all the way to the first of July, 2017. All Blacks versus the British and Irish Lions – the second Test of a momentous series. It was the last time New Zealand went through an entire match without scoring a try, and that makes it a collector’s item. That was 24 games ago. It happened again on a balmy autumn evening in Dublin last Saturday. In Wellington, Sonny Bill Williams was sent off for a head-high challenge on Anthony Watson and the home side were forced to play for more than two-thirds of the game with only 14 men. At the Aviva stadium, New Zealand kept all their players on the field for the full 80 minutes, but could not penetrate the emerald green blanket. The real common denominator in the two games is not Williams, but Andy Farrell – the Irish and Lions’ defence coach. ‘Faz’ oversees a defensive system with high line-speed and pressure on the key passers in the attacking side. Although there has been much talk of New Zealand developing methods to counter the rush defence ever since the Lions series, when push came to shove, the All Blacks were unable to break down the Irish rear-guard. Against England at Twickenham on the previous Saturday, the All Blacks had engineered 14 clean breaks in far less propitious weather conditions. Against the Irish, that figure dropped to five. The raw stats support the difficulty New Zealand teams have had in breaking down a Farrell defensive structure over the last three years. The All Blacks score far more freely against sides with defences that are not coached by Farrell. When he is on the opposition coaching staff, it now represents a big problem. On the 2017 Lions tour, the All Blacks and the Kiwi regional teams managed 16 tries over the eight tour games. The signs are that it is getting more and more difficult to score – seven of those 12 New Zealand tries were scored back in 2016 in the two-game series against Ireland in Chicago and Dublin, with only five tries scored over the last four matches against the Lions and Ireland. The strength of the Irish coaching staff lies in the creative dynamic between the detailed, ball-control mindset of head coach Joe Schmidt and the defensive backbone provided by Farrell. This means Ireland are capable of both keeping the ball for long periods, while also giving up few chances when they don’t have it. That makes them a tough team to play. Schmidt’s other USP is his facility at fashioning set-piece packages to exploit weak spots. I explored one of his patented moves in an article before the Ireland tour of Australia in June. Against England, in the final round of the 2018 Six Nations, CJ Stander scored Ireland’s second try after a neat piece of ‘misdirection’ by Johnny Sexton and Tadhg Furlong in the first wave of attack. 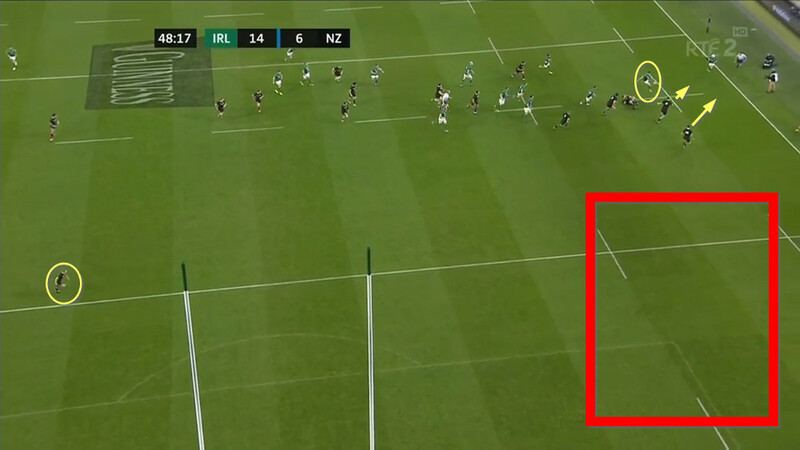 Sexton and Furlong faked the wrap-around move so dear to Sexton’s heart to create a hole for Bundee Aki to run through. The idea of ‘misdirection’ is imported from American football. It means you try to pull defenders towards one apparent area of attack in order to take them away from the real target zone. Here is one good example from gridiron. In the view from behind the posts, the flow of offensive blocking is in one direction (towards the right of the attacking team in blue) and this draws the defenders to that side of the field. The real area of attack is on the opposite side, but only the ball-carrier and one other blocking back are assigned to it in order not to tip off the play to the opponent. In recent weeks, there have been a number of terrific examples of misdirection used to tempt aggressive defences to ‘bite’ on the first attacking move. Remember this try by the All Blacks in the third Bledisloe Cup game in Yokohama? The whole idea is to fake an open-side attack in order to strip down the real target area on the blind-side. Two passes by Kieran Read and TJ Perenara achieve the first part of the exercise, so that Wallabies fullback Dane Haylett-Petty is well away from the scene of the action as it develops. But, ultimately, it is just a two-on-two, with the All Blacks backing Rieko Ioane and Beauden Barrett to be better at attacking in space than Will Genia and Israel Folau are at defending it. They were proven right, and it earned them seven points. England used the same principles to score their first try at the start of the game against New Zealand. Taking this clip in isolation, it might appear Rieko Ioane has made a blunder by not staying out with his opposite number, Chris Ashton – giving the England flyer space to score in the corner. But that first impression would be deceiving. Take a look at the start of the clip, and Damian McKenzie is clearly visible defending the backfield space behind Ioane, ready to come up into line outside him. But at the end of the play, McKenzie (along with another line defender on that side, Williams) has gone missing. So, what happened? Let’s take a look at the same sequence from behind the posts. 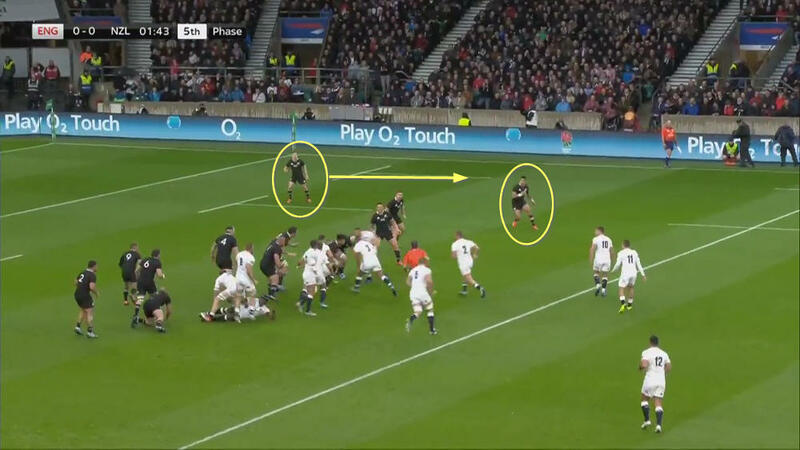 As Ben Youngs bent down to pick up the ball at the base of the ruck, three England backs (Owen Farrell, Jonny May and Elliott Daly) were all in motion to the left, which persuaded Sonny Bill (on the line) and McKenzie (in the backfield) to leave their posts and follow them across to the far side. That, in turn, gave Ashton the precious couple of strides he needed to beat McKenzie into the corner – misdirection at its best! The solitary try in Dublin bore the same unmistakable thumbprint – in fact, it closely resembled the construction of the All Blacks’ own try in Yokohama. Although the starting set-piece is a lineout rather than a scrum, two passes are made to the open-side before the ball is turned back towards the original sideline by Aki – exactly as in the New Zealand-Australia game. The move set up a straightforward two-on-two, as in the Bledisloe game, with a tight forward and a wing on either side – Jacob Stockdale and Rory Best for Ireland, Brodie Retallick and Ben Smith for New Zealand. Once again, the most revealing angle is from behind the posts. Ben Smith started at blind-side wing in the backfield, then moved up to the line as he recognised the threat developing. Behind him was the real target area, the backfield space which Smith had to vacate, and which McKenzie neglected on the far side of the field. McKenzie was two steps too slow to get to the critical theatre of the action and that was enough for Stockdale to win ‘the race to the space’ and score. On the day, Ireland were the better side. It does not make them either the number one team in the world or favourites for the world cup in 2019, as Steve Hansen suggested in his post-match press conference. The All Blacks have earned the right to both of those tags over a long period of time. The game in Dublin was indeed a case of ‘the biter, bit’ in terms of the All Blacks’ use of misdirection against the Wallabies and Ireland’s adoption of a replica move to unlock the New Zealand defence. It will have done Schmidt’s chance of becoming the next coach of New Zealand no harm at all, and that is a double irony. Of more concern to the All Blacks coaching staff will be their inability to manufacture the volume of chances they are used to creating, or finish those they did make. On Saturday evening’s evidence, they have yet to come up with a convincing plan to counter Andy Farrell’s rush defence. The green line held firm, even under the most intense pressure in the final quarter of the game. The question asked as long ago as June 2017 by the Lions still remains unanswered, and that is an intriguing, critical sub-plot to the drama of North versus South which will be enacted in Japan just ten short months from now.